It's no secret that I love Waldo Pizza. But for thick, Chicago-style pies I recommend The Dish in Liberty. Fatties foodies need no longer take a trip on I-29 to partake. 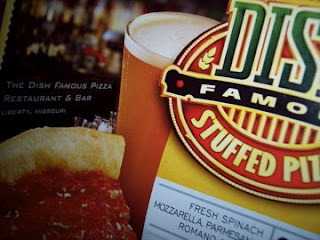 Vacuum-sealed pizzas from The Dish are now available on the frozen food aisles of local grocery stores. And they're good. But get ready for sticker shock. I can't decide which option is wiser- ordering inferior but ostensibly fresh pizza from a delivery company or going with the frozen version of the area's best deep dish pizza. Never cared for deep dish pizza. Never will. We live pretty close to Waldo Pizza so they deliver to our door. I love St. Louis style and I believe Phil's and Co. blows Imo's away. However, I rate Johnny C's right up there with Waldo Pizza. I just don't like to drive that far for pizza though. bgo - they have a good thin crust too. Erin, yeah, I know about their thin crust and it is available frozen too. We've had it and it is decent. I like their Chicago Hot Beef Roll though.